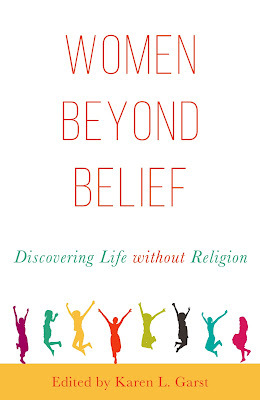 In this post, I am going to introduce you to three of the 22 women who wrote their personal stories of leaving religion in my book, Women Beyond Belief: Discovering Life without Religion. Hopefully you will agree with my assessment that it took strong doses of courage, will, and strength to share their stories with us. In Fundamentalist theology, people don’t just commit sin—they are sin. Because Adam sinned, every person born after him was born with a sinful nature and is inherently corrupt. As if that weren’t enough, there were sins of commission (when you did something you shouldn’t) and sins of omission (when you didn’t do something you should). If there is another religion that vilifies humans more than Fundamentalist Christianity, then I feel sorry for its adherents… As a child, I felt guilty for small transgressions, even things that were normal childhood behavior, such as wishing I could stay home from church on Sunday night to watch Disney or snitching an extra cookie when mom wasn’t looking. I wanted to be pretty, but I worried that I might be committing the sin of vanity, and I felt conflicted about trying to look nice. As I grew older, I struggled to be good so I could stop feeling awed and wrong, and I developed a debilitating perfectionism. Ann worked through this traumatic childhood by writing. A few weeks ago, she told me the following. I wanted to let you know about something I experienced recently, and I think it’s partly a result of writing my essay. In all of my struggles my biggest hope has been that someday, my religion will lose so much power over me that it will simply become irrelevant. I went to the beach this weekend for some solitude, and as I was sitting there staring at the waves and contemplating, I suddenly realized that that’s exactly how I’m beginning to feel. I know it’s the culmination of many years of effort, but I think there was something about putting it in print. Wow – I can't even begin to describe what a new level of freedom that is. I just wanted to say thank you for the opportunity to write my story and put it out there where it may help someone else. Cael was raised in the Christian denomination of Jehovah’s Witnesses. In college, she began dating a boy who was not of her faith. And inevitably, they slept together. A friend ratted them out to the elders and she was called before a tribunal. After they called her boyfriend the devil, she tried to convince them that she loved her boyfriend and that he couldn’t be the devil. Believing still that God was real and his Holy Spirit was directing the men outside, I was convinced by my conditioning that my case would be dealt with justly—after all, this was my first offense in my twenty-three years of life. Finally, they led me into the small room and sat back down. They all read a scripture that they had personally chosen for me and then informed me that they were leaning toward disfellowshipping me—the highest punishment available to them—but by the grace of one elder who had known me for years, they decided to grant me a reprieve to think upon their counsel and come back repentant. And in that instant, my faith shattered. Cael later married this man, the love of her life, and they have two beautiful children. She is writing under a pseudonym, however, because some of her family doesn’t know about her leaving the church. If they did, they could no longer see her or talk to her. Ute grew up in Germany and emigrated to the United States when she married an American at 25. She notes the contrast to her native country upon arrival. I tried to ignore the constant talk about god in politics. None of this made sense to me. I had never heard German politicians say, “God bless Germany.” Yet American presidential elections appeared to always involve pride in the candidate’s Christian belief. To me it seemed quite evident that no atheist would ever be elected president of the United States. I discussed this issue with a friend once and she accepted this fact as normal and even desirable. She said she was never going to give her vote to an atheist. Once again, I was flabbergasted. She smiled at me and said it was okay. She told me that eventually I would find god. I just hadn’t tried hard enough yet. She casually invited me to her church and insisted that if only I gave it a try, I would certainly find faith there. It was different and more relaxed than other churches, she said. She couldn’t wrap her mind around the fact that there were people out there who were not trying to find god. Everyone was, according to her. The contrast between Europe and the United States is quite striking. Maybe that is why one of the least religious countries, Iceland, is the leader in wage equality for women. I hoped you have enjoyed these quotes from some of the essays. I’ll do a few more next time. After that, you’ll just have to read the book!